Secretary training is essential if you wish to embark on a career as a secretary. There are several different kinds of positions available in this field, and different training is required as preparation for each. Not only are there different roles but also different levels. Basic entry level jobs will have a few different requirements than someone with an executive secretary job. The right training program will depend on the kind of secretarial role that is desired and the kind of pay that is wanted. An entry-level position will start off low, but could climb with experience. The more education that is obtained and the more specific the secretarial course, the better the chances for pay increases and a better job as a secretary. Clearly, finding out about the pay and the types of jobs offered could impact on your choice of area of study. This page tells you what the various types of secretary are, what courses are required, what you can earn, and the prospects. You might also like to check the page on office administration programs. Learning about the different types of positions, may help someone finding the one that is right for them. An entry level role is one that will require some basic training. This training could involve a secretary college program which is a one year certification. The program will teach typing skills and learning how to be fast on the keyboard. 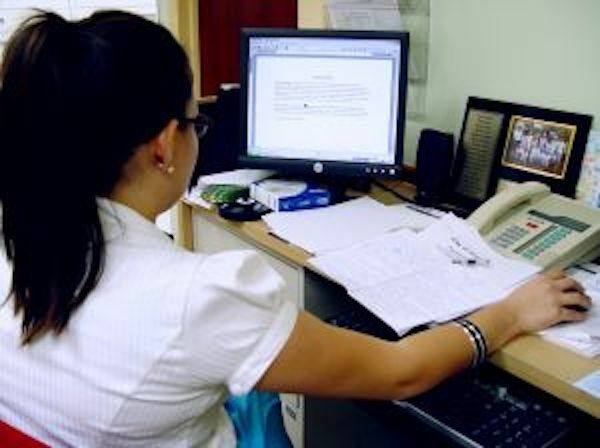 Extensive computer training is also provided to ensure that whatever computer programs are used in the workplace, that the secretary is fully trained. Many companies will hire a range of secretaries for their offices. There will be a few basic entry level roles and a few senior management secretaries. The pay for someone in the entry position may range around the 20k mark. There are some key ways to become more trained and qualified for higher up positions. For example, those wishing to obtain legal secretarial jobs will need to seek additional studies and training. An executive role will require the employee to have a degree in administrative studies. It will require more education, training and course study in order to complete the area of study. This program may be a one or two-year program at college or a full four-year degree. Executive secretaries are typically found working with top executives of a company. A top executive may need a top receptionist who is able to keep up with the professional demand of the business. This person would need to be fully trained, well experienced and able to manage the duties associated with a top person in a company. The salary for this particular role could range between 34-46k a year, as well as a yearly bonus. There are also ways to specialize in the training, e.g., to become a medical secretary. A program for this role may run between one to two years. This role would involve working in a doctor’s office. They would be in charge of billing and coding and preparing accounts for insurance companies after a patient visits. They may also file charts, organize them and keep them up to date. Arranging appointments and filing out chart work are just some of the busy responsibilities found within this position. Typically, training for legal secretaries will take from one to two years. The course is unique to the legal field and will fully train someone to be able to handle the documents and files found within a law office.